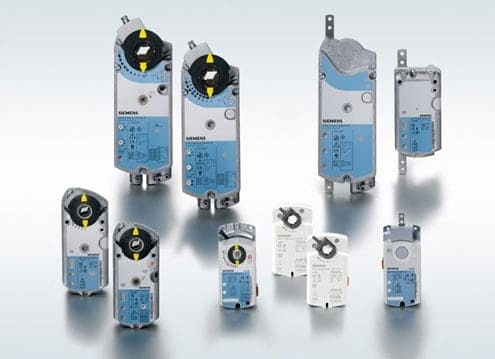 Contel offers a wide range of damper actuators in the SIEMENS OpenAir Series for linear or rotary motion, for continuous control 0-10 VDC or ON/OFF control, and operating voltages of 220 VAC or 24 VAC, and according to the appropriate torque for the damper actuator surface. The ®OpenAir Series also includes fire and smoke damper actuators. OpenAir™ offers you a comprehensive portfolio of energy- and cost-saving damper actuators. The actuators are used in millions of applications worldwide. Thanks to their rugged, compact design, they’re not only easy to install but also extremely durable in operation, during transport and on the construction site. High precision provides a pleasant, controlled room climate and ensures optimal energy efficiency, which helps to reduce operating costs. Thanks to extensive tests and field support, OpenAir damper actuators are first choice for building and room automation professionals.